•1/4 Inch Mono Straight to Right Angle Cable! •High Density OFC 99% Braided Shield! •Heavy Duty 24K Gold Plated 6.3mm Mono Plugs! •Extra Thick 7Mm/0.28 In Diameter Tweed Braided Cloth Jacket! •A Stronger Zinc Diecast Shell，Easy to disassemble - making incidental repairs quick and easy! •An External Rubber Heat Shrink Strain Relief, Internal Rubber Booty Strain Relief! •24 AWG oxygen-free copper conductor provides exceptional signal transfer and rejects interference handling noise! •10 feet cables with braided tweed cloth jacket are durable for long-term use, ideal for medium runs, such as guitar-to-pedal board and medium stages! 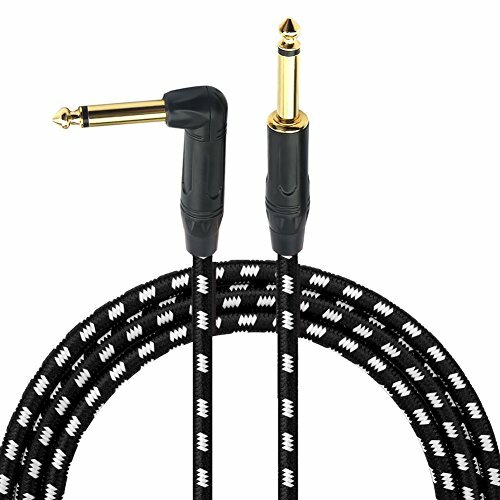 •This Instrument Cable'S Construction Remains Very Flexible, Doesn'T Get Tangled! •Perfect for connecting your keyboards, drum, Amp or pa, mixer, power amplifier, microphone, effector, decoder, equalizer, electoronic organ, electric guitar, electric bass and other electronic equipments andthe installation of smart home, karaoke speaker, professional stage audio, etc! Upon purchasing, In Gedkoa,we offer free 90 days return and a free 24 months warranty. Purchase with confident.Right out of the box, you will feel the difference and quality of this Guitar cable. Now!You Are Deserve it, So Be Sure to Click Add to Cart Now! OXYGEN FREE COPPER - AWG24 Conductor, Provides A Better Conductivity And Quality For Guitar, Bass, Or Other Instruments Playing.Make The Music Sound Clearer And Full.We offer 5 color : Black,Blue,Purple,Orange,Green. HIGH-DENSITY OFC - 99% Braided Shield,Brings This Cable A Strong And Durable Construction.Rejecting Handling Noise And Interference,Noiseless. HEAVY DUTY 24K GOLD - Plated Plugs Provide Superior Signal Flow And Corrosion Resistance.Housed In A Stronger Zinc Diecast Shell.Straight To Right Angle 1/4-Inch Connectors With Strong Interior Solder Points. TRIPLE STRAIN RELIEF - This Cables Have An External Rubber Heat Shrink Strain Relief, Internal Rubber Booty Strain Relief, And An Internal Metal Clamp Strain Relief.Makes The Protection Go A Step Further. EXTRA THICK 7MM/0.28 INCH - Diameter Tweed Braided Cloth Jacket To Reduce Handling Noise,Super Durable Flexy.Protects Your Guitar Cables Against Cuts And Breaks Caused By Twisting And Kinking.This Instrument Cable'S Construction Remains Very Flexible, Doesn'T Get Tangled. If you have any questions about this product by GEDKOA, contact us by completing and submitting the form below. If you are looking for a specif part number, please include it with your message.